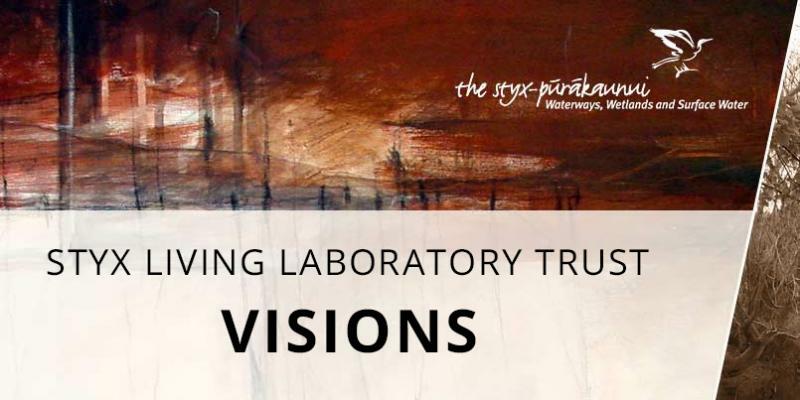 After extensive community consultation, the Christchurch City Council wrote a document called "Vision 2000 - 2040 The Styx" with five Visions for the Styx River Catchment. Vision 1 - Viable Springfed River Ecosystem to complement the other representative protected ecosystems of Christchurch such as the Port Hills, Travis Wetlands and the Coastline. Protect and monitor remnant indigenous vegetation and the effect of weed invasion on them. Identify and protect natural landforms. Restore a range of viable habitats that reflect the range of indigenous ecosystems in this area, based on the underlying soils. Undertake predator control as necessary. Reintroduce native species in suitable locations (eg fernbird at the mouth of the Styx River). Investigate methods to increase the number of trout and the number and range of native fish species within the Styx River. Monitor, mitigate and remedy the effect of land use change on water quality and other ecosystem attributes. Restoration projects are essential if the Vision ‘to achieve a viable spring-fed river ecosystem’ is to be realised. The Styx River ecosystem, although highly modified, retains relatively high ecological values. Native plants are regenerating under the taller willow tree canopies that line many of the waterways. These waterways act as corridors for the upstream and downstream migration of birds, fish, invertebrates and plants. Each restoration project aims to build on these values through enhancing natural character, wildlife habitats and the development of linkages and core habitats. Restoration projects also develop opportunities for people to experience, understand and enjoy nature. Over time the cumulative effect of the many individual restoration projects time results in a healthy, well-balanced, fully functioning river ecosystem, to be enjoyed by both present and future generations. Vision 2 - Urban National Reserve will create a "Source to Sea Experience". Vision 3 - Living Laboratory that focuses on both learning and research as practised by Dr Leonard Cockayne (1885). Establish an inclusive working party to oversee the development and implementation of a research and learning programme. Develop a common accessible source of information that contains electronic databases of information and a geographic information system (GIS) that is regularly updated. Develop joint projects with communities in other areas to compare and contrast the Styx River and its environs with other ecosystems. 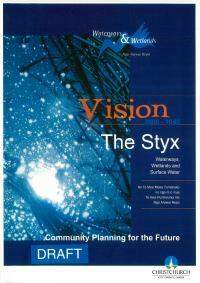 Vision 4 - The Styx Community - To establish "The Styx" as a place to be through maintaining and enhancing the special character and identity of the area. Unique branding and identity based on the copyrighted Styx logo - The White Heron. The Kotuku, (White Heron), has been chosen as the logo to represent the Styx Catchment for several special and differing reasons. Firstly it is a symbol of something rare and beautiful. Early inhabitants of New Zealand often regarded this native heron as the magical ‘bird of a single flight’, for to see one was usually a ‘once in a lifetime’ occurrence. Today this belief still applies, although from time to time one of these majestic birds may be sighted wading through shallow waters in the Styx River catchment. The second reason for choosing the White Heron is its association with both mythology and death. The Kotuku occupies an important place in Maori mythology for it is said that it is an inhabitant of the other world, the spirit land of Reinga. Ancient Maori believed that if a Kotuku was ever sighted it heralded the death of a Great Chief. Greek mythology, according to Homer’s Iliad (BC 9-8), records the Styx River as the principal river of the lower world, which had to be crossed in passing to the regions of the dead. It would appear that an early settler, observing Maori washing the bodies of their dead in the Styx River as part of their funeral rites, made an association between the Styx River of Greek mythology and the Styx River of Christchurch, New Zealand. Mythology plays a further part in this river’s association with death as in Maori mythology the Kotuku is recognised as the bird that transports souls from this world to the next. It is therefore for reasons of its beauty, its rarity, it links to Maori mythology, and its association with death, that this stately bird has been chosen as a symbol appropriate to the Styx area. In Maori oratory to compare a person to a Kotuku is regarded as a compliment of the highest order. Likewise, selecting the Kotuku as a symbol of the area, honours the uniqueness and beauty of the Styx River and its catchment. On the 10 June 2008 park rangers, teachers and a group of students from Harewood School were the first to observe a White Heron in the Styx Mill Conservation Reserve, where it was roosting in the willow trees and feeding on bullies and other small fish in the lakes. The White Heron was the first recorded sighting of this species in recent times, making it the 49th to be seen at this location. Stage a series of events that will enhance this area as a ‘place to be'. Vision 5 - Foster Partnerships through raising the quality of relationships as we move forward together. Obtaining a holistic understanding of the dynamics of the Styx River including its ecology, drainage, landscape, culture, heritage and recreation. Raising awareness of the Styx River Catchment and its environs. Promoting the use of the Styx River Catchment as a collective resource for environmental and social research, and to co-ordinate that research. 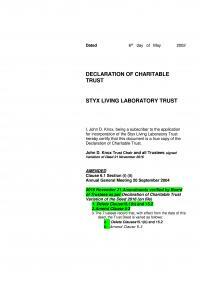 Using the knowledge and understanding acquired by the Trustees to assist the bodies who have legal responsibility in the future management of the Styx River Catchment. Maximising opportunities for community involvement in research and learning. Providing a learning medium for other similar ecosystems. Working with other organisations or people to achieve the above objectives and using a memorandum of understanding where appropriate. Assisting other people and other organisations to achieve the remaining visions in "Vision 2000 - 2040 The Styx"
Recognising the view and expectations of Tangata Whenua, to respect and implement the dual heritage of the partners of Te Tiriti O Waitangi (The Treaty of Waitangi) in attaining the above objectives.